Your company can "rest" knowing you've selected this incredible marketing tool. 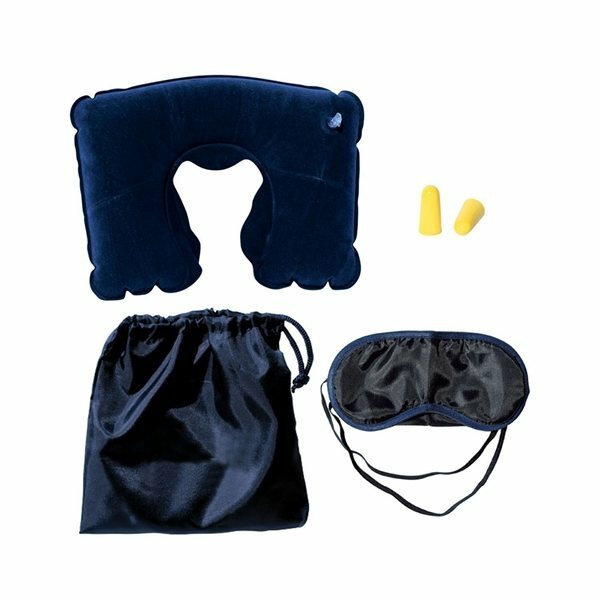 This Captain Travel Kit with Neck Pillow makes a handy giveaway. This terrific kit includes an eye mask, inflatable neck pillow, ear plugs and a polyester drawstring bag. All items are individually poly-bagged. People will think of your business when able to relax on the go. This is an excellent choice for airlines, travel agencies and tour companies. These were perfect gifts to give our conference attendees! The imprint looked great and fast and accurate. Everyone here likes them. This item is very unique that there was not a single product at the recruitment fair was similar. I bought this product because I was given one by a hospital program I was in. The product is excellent. the product seems better than expected, It's a great item. Top quality and printed as guaranteed. Product quality was great. Size of logo was so good.